Select an option To My Favorite Peeps One of My Favorite..
Easter is Sunday, April 21, 2019 this year. This cute and clever Easter Peeps card is perfect to give to one of your friends or family members. This card can be fully customized and personalized at no extra charge and also includes a free matching colored envelope, round envelope seal, and a U.S. Forever postage stamp. 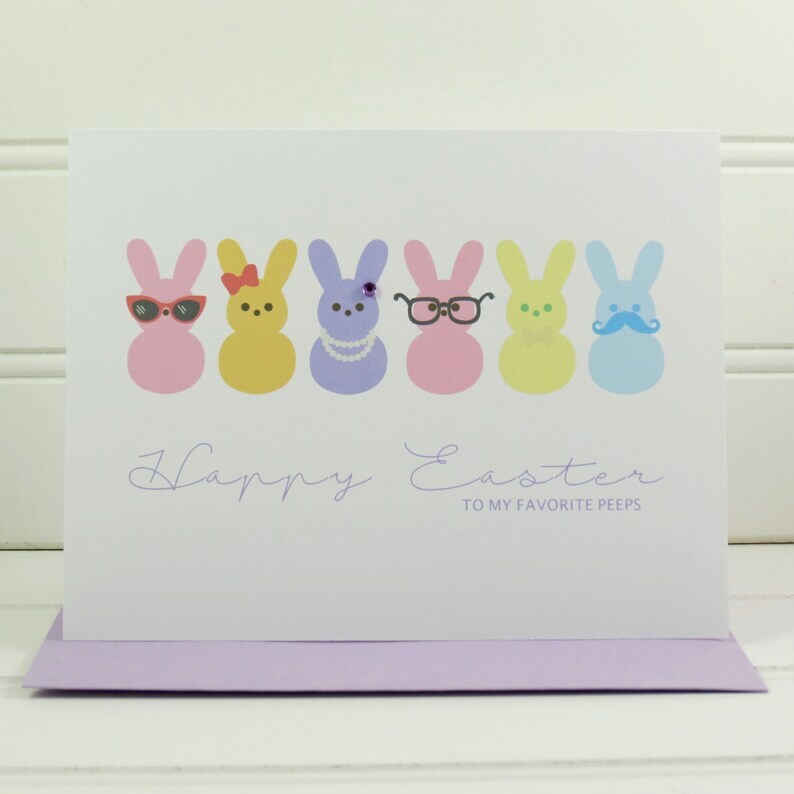 On the front of the card, there is an illustration of six Easter bunnies in Easter colors sitting next to one another. The message below the illustration says, "Happy Easter To My Favorite Peeps" or you can select to have the card say, "Happy Easter To One of My Favorite Peeps". The card measures 4.25” x 5.5” when folded and is blank on the inside. These Easter cards are the best cards! They are adorable and so pretty. Great service and quality. I buy from Etsy shops often, and this is the first negative review I have ever written. Heads up to buyers.. if your item is lost or not received, nothing will be done about it. I was told once it is mailed it is between you and the post office. She actually stated she went “above and beyond” for even having them update the tracking information. Wish I would have known about the lack of customer service before placing an order. Be sure to read policy details before ordering! Nice item. Good Seller. Fast Delivery! !